Introduction: Marginal leakage is one of the significant causes of restoration failure. This in-vitro study was conducted to compare cone beam computed tomography (CBCT) and dye-penetration methods for determining marginal leakage at gingival surface of class V resin composite restorations. Materials and Methods: Class V cavities were prepared on the buccal surfaces of nineteen caries-free extracted human molar teeth. Cavities were conditioned and filled. The teeth were immersed in a 50% w/w aqueous silver nitrate solution for 24 h and were taken out and rinsed with distilled water. Then, they were put into a developing solution. Whole specimens were first viewed with CBCT and were then sectioned and evaluated by stereomicroscope. Results: Measurement of agreement between CBCT and stereomicroscope revealed that 15 (78.9%) teeth had score 0, 1 (5.3%) tooth had score 1, and 1 (5.3%) tooth had score 2 in both techniques. 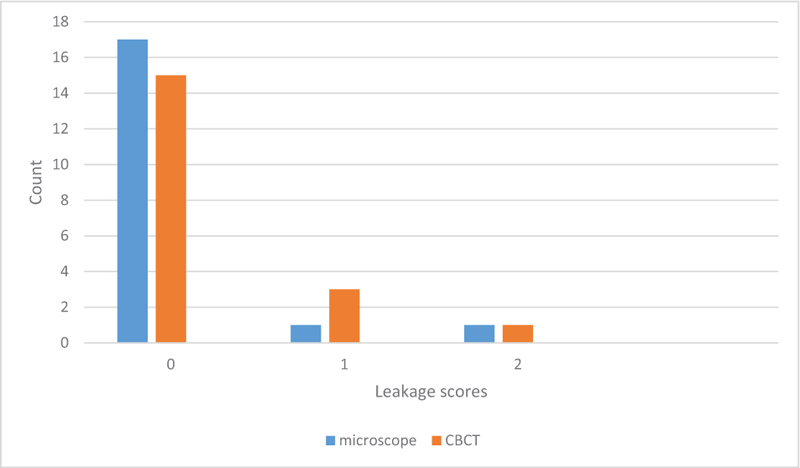 Measurement of agreement between CBCT and stereomicroscope techniques, in the detection of marginal leakage, was 89.5% (Kappa coefficient = 0.627, P = 0.00). The Wilcoxon paired rank test revealed no significant difference between the results of CBCT and stereomicroscope in measuring the leakage at gingival margin (P = 0.157). Conclusion: Considering the limitations of the study, there was no significant difference between the results of CBCT and stereomicroscope in measuring the leakage at gingival margin of class V composite restorations. CBCT can be used noninvasively to detect the marginal leakage of gingival wall of class V composite restorations using aqueous silver nitrate solution as a tracer. There are various in-vitro methods for detecting marginal leakage such as dye-penetration method, compressed air, electrochemical approaches, bacteria infiltration and scanning electron microscopy (SEM). Recently, micro-CT is suggested for the assessment of marginal leakage in adhesive restorations and pit and fissure sealing. The introduction of cone beam computed tomography (CBCT) into maxillofacial imaging makes CBCT superior over CT owing to rapid volumetric image acquisition (as low as 18 s) from a single low-radiation-dose scan of the patient. CBCT can provide submillimeter spatial resolution for images of the craniofacial complex. The voxel size in CBCT may be as low as 0.1 mm, smaller than that achieved with conventional CT-scan units. Because of wide application of CBCT in dentistry and the importance of detecting marginal leakage of restorations, this in-vitro study was conducted to compare CBCT and dye-penetration method for determining marginal leakage at the gingival surface of class V resin composite restorations. Nineteen caries-free extracted human molar teeth were selected and cleaned of calculus, soft tissue and debris by hand instrumentation. After surface debridement, they were stored in 0.5% chloramine-T solution in refrigerator. It took 2 months to collect the extracted teeth. All the teeth were prepared and restored by a single operator to prevent interoperator bias. A class V cavity was prepared on the buccal surface of each tooth, by a cylindrical diamond bur (Tizkavan-Iran) which was mounted on a high-speed headpiece, using air–water coolant spray (CH-4T5NSK B2/B3, Japan A1101800). Every four cavities were prepared by a new bur to avoid crack formation at the edges of cavity. The cavities were checked by stereomicroscope to find probable cracks in the margin of cavities. The cracked margined teeth were eliminated from the study to avoid false positive results due to permeation of the tracer through these spaces. Cavities were 3 mm in width, 1.5 mm in depth and 2.5 mm in height. The cavities were so prepared that the gingival margin of each cavity was extended beyond the cemento-enamel junction (CEJ) onto the cementum and occlusal surface was limited in the enamel. The occlusal and gingival surface margins of cavities were sharp and nonbeveled. Cavities were conditioned by Cleafil SE Bond (SE: self etching) (Lot No. 71167; Kuraray Medical Inc., Okyama, Japan) adhesive system. The adhesive systems were applied according to the manufacturers’ instructions, restored by composite resin (GRADIA DIRECT, Anterior, CE0086, Japan) and cured for 40 s using 700 mW/cm2 light intensity LED light cure (LED Turbo light cure-Taiwan). The composite restorative material was applied and condensed incrementally until the preparations were completely filled. Each increment was light-polymerized for 40 s prior to placement of the subsequent increment. The teeth were kept in distilled water for 24 h at 37°C. To prevent silver penetration in areas other than the exposed margins, the tooth surfaces were then sealed with two layers of nail varnish to be within approximately 1 mm of the restoration margins. The teeth were left at room temperature for one day to allow the nail varnish to dry. Then, they were immersed in a 50% w/w aqueous silver nitrate solution for 24 h in the dark at room temperature. After that, the teeth were brought out and rinsed with distilled water. Then, they were put into a developing solution (Dental X-Ray Developer, KONIX, Turkuaz, Istanbul, Turkey) for 8 h and again were abundantly rinsed with water. The teeth were cleaned by using a toothbrush to remove silver depositions on the surface. The teeth were mounted in the sockets of a human mandible bone and viewed first by CBCT. All CBCT images were taken by New Tom (New Tom VGi evo; Quantitative Radiology, Verona, Italy) with a flat panel detector. The adjusted scan parameters were 110 kVp, 3 mA and 4.3 s. Field of view was 8*5 Hi Res. and voxel size was 0.15 mm. CBCT projections were analyzed by NEWTOM software NNT version 5.5 (IMOLA-BO, Italy) in cross-sectional plane (slice thickness = 0.5 mm and slice distance = 0.1 mm) by two maxillofacial radiologists to detect marginal leakage along the gingival surface of class V cavities. No software used for artifact reduction. After taking CBCT projections, the teeth were mounted into green self-curing acrylic resin and sectioned into two halves longitudinally in buccolingual direction by a tooth-sectioning device using water-cooled diamond disk (Cutting Machine, Vafaei Industrial CO, Iran). The sectioned teeth were evaluated by two observers for the penetration of silver nitrate using a stereomicroscope with ×16 magnification (Trinocular Zoom Stereo Microscope, SMP 200, HP, USA) and a digital camera (Moticam 480 Digital camera, SP10.0224, Motic Instruments Inc., USA). The marginal leakage grades were as follows: 0 – no leakage visible, I − penetration of dye less than half of the gingival floor depth, II − penetration of dye more than half of the gingival floor depth, III − penetration of dye along the axial wall. Statistical comparisons were made between CBCT and stereomicroscope data to assess equality in leakage measurements scores of the above methods. The data for leakage scores at gingival wall were compared between CBCT and dye-penetration method by Wilcoxon paired-rank test. The data were analyzed by the Statistical Package for the Social Sciences version 22.0 software (IBM Corp., Released 2013, IBM SPSS Statistics for Windows, Version 22.0, Armonk, NY: IBM Corp.). Significance level was set at 0.05. The Kappa coefficient showed an interobserver agreement of 0.83 for CBCT projections (P = 0.00). The Kappa coefficient for interobserver agreement of microscope data was 1.00 (P = 0.00). Measurement of agreement between CBCT and stereomicroscope revealed that 15 (78.9%) teeth had score 0, 1 (5.3%) tooth had score 1 and 1 (5.3%) tooth had score 2 in both techniques. Measurement of agreement between CBCT and stereomicroscope techniques, in the detection of marginal leakage, was 89.5% (Kappa coefficient = 0.627, P = 0.00). The Wilcoxon paired rank test revealed no significant difference between the results of CBCT and stereomicroscope for leakage measurements at gingival margin (P = 0.157). 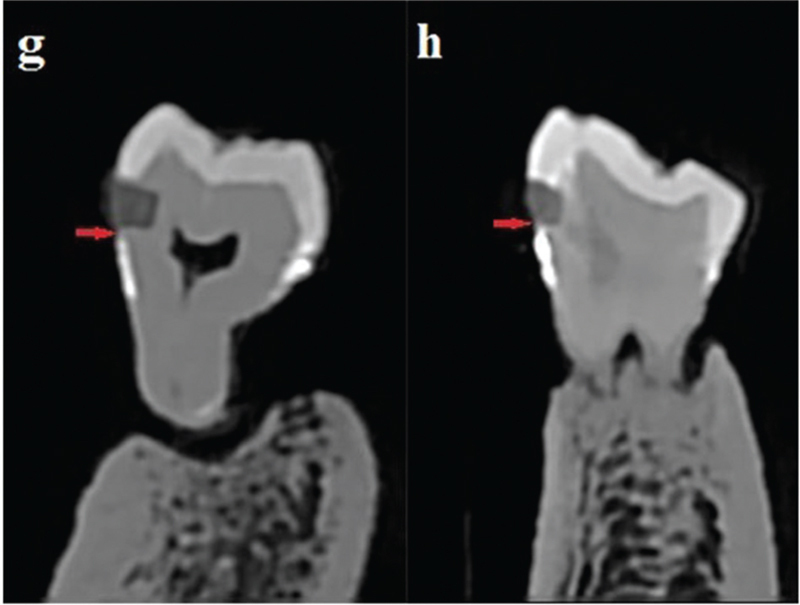 [Figure 1] shows the marginal leakage scores at gingival wall under stereomicroscope and CBCT. [Table 1] lists the leakage scores along the gingival wall of each restoration measured by CBCT and stereomicroscope. [Figure 2] displays the number of teeth in each leakage score using CBCT and stereomicroscope. Marginal gap formation risk exists during placement of composite resin on dentin or cementum. This gap predisposes the restorative margin to microleakage, which is the passage of fluids, bacteria or molecules between the cavity wall and the restorative material. Marginal leakage is the major cause of failure in composite restorations, which results in sensitivity, margin coloration, secondary decay, and pulpal inflammation. Marginal leakage due to polymerization shrinkage in the CBCT has been developed as a complement to multislice CT in the oral and maxillofacial region with lower patient radiation dose and lower cost. It is widely used in dentistry and can display multiplanar images such as axial, coronal, and sagittal planes can allow 3D visualization of the areas scanned and can provide the minimum voxel size of 0.1 mm3.,,, Like micro-CT, CBCT is nondestructive to the specimens tested for marginal leakage because there is no need to cut the specimens. To date, no study has been reported on the detection of marginal leakage of class V composite resin restorations using CBCT. 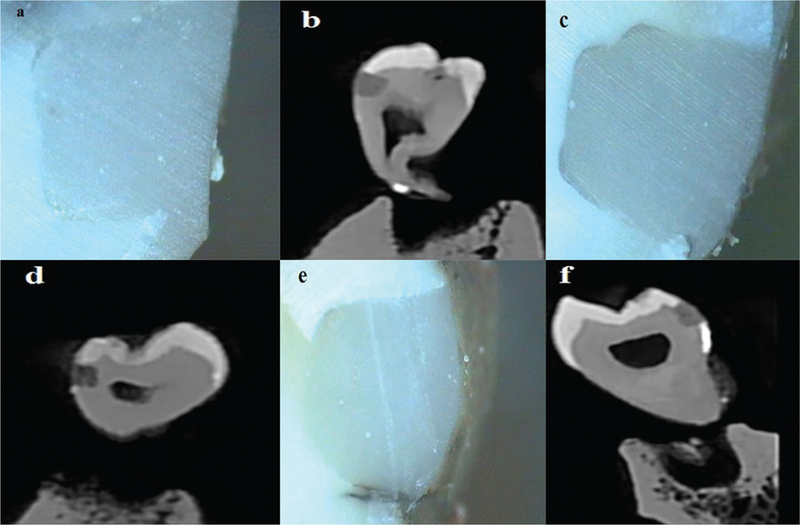 In this study, silver nitrate solution was selected because it is able to image marginal leakage as radio-opaque in relation to the restorative material and tooth structure. Our results showed an agreement of 89.5% in detecting marginal leakage between CBCT and stereomicroscope. In fact, CBCT could display all the teeth with marginal leakage. But in three teeth (tooth numbers: 9, 14, and 15), there was disagreement between CBCT and microscopic findings. It may be due to the radioopacity of silver nitrate, which had been attached to the root surface near the filling material and had not been removed during brushing. The proximity of radioopacity of the tracer to the gingival wall of cavity misleads the observers in CBCT. However, the presence of a short distance between the radio-opaque tracer and the gingival surface of restoration on CBCT projections is helpful in differentiating the silver teeth with and without leakage when the tracer is remained on the root surface in spite of brushing [Figure 3]. Microscopic and micro-CT studies reveal that in class V composite resin restorations, the leakage is more severe at the cervical wall than at the coronal wall. Likewise, this study assessed the marginal leakage of cervical margin of class V composite restorations. Studies have shown that mid-longitudinal section is not enough to detect leakage at the cervical wall. Microleakage was not uniformly distributed. In other words, leakage may even occur locally in the mesial or distal edge of cervical wall of the cavity. Thus, several sections are required to evaluate the leakage under microscope. But in micro-CT and as this study showed, CBCT has the advantage of displaying multiplanar images of marginal leakage and providing the possibility of moving between sectional images in cross-sectional plane or any other plane while the tooth integrity is preserved.,, In CBCT part of this study, the teeth were not only evaluated in the middle section of cross-sectional plane, but all buccolingual sections of gingival wall from mesial to distal edge were assessed. The conventional dye-penetration method is known as a wildly used standard method to determine marginal adaptation. Although using SEM is more accurate in assessing marginal adaptation, this method is more expensive and cannot be used for all of the samples. So, impossibility of using SEM instead of dye penetration method can be one of the limitations of this study. Despite the limitations of this in-vitro study, it can be concluded that CBCT can be used noninvasively to detect the marginal leakage of gingival wall of class V composite restorations using aqueous silver nitrate solution as tracer. There was no significant difference between the results of CBCT and stereomicroscope in measuring the leakage at gingival margin of class V composite restorations. The authors would like to appreciate the Dental Material Research Center of School of Dentistry, Isfahan University of Medical Sciences. This study was part of a research project (Grant No. 295257) supported and funded by Isfahan University of Medical Sciences. Rengo C, Goracci C, Ametrano G, Chieffi N, Spagnuolo G, Rengo S et al. Marginal leakage of class V composite restorations assessed using micro computed tomography and scanning electron microscope. Oper Dent 2015;40:440-8. Zhao XY, Li SB, Gu LJ, Li Y. Detection of marginal leakage of class V restorations in vitro by micro-computed tomography. Oper Dent 2014;39:174-80. Deligeorgi V, Mjor IA, Wilson NH. An overview of reasons for the placement and replacement of restorations. Prim Dent Care 2001;8:5-11. Peumans M, Kanumilli P, De Munck J, Van Landuyt K, Lambrechts P, Van Meerbeek B. Clinical effectiveness of contemporary adhesives: A systematic review of current clinical trials. Dent Mater 2005;21:864-81. Mali P, Deshpande S, Singh A. Microleakage of restorative materials: An in vitro study. J Indian Soc Pedod Prev Dent 2006;24:15-8. Costa JF, Silqueira WL, Loguercio AD, Reis A, Oliveira E, Alves CM et al. Characterization of aqueous silver nitrate solutions for leakage tests. J Appl Oral Sci 2011;19:254-9. Moshfeghi M, Tavakoli MA, Tavakoli Hosseini E, Tavakoli Hosseini A, Tavakoli Hosseini I. Analysis of linear measurement accuracy obtained by cone beam computed tomography (CBCT-NewTom VG). Dent Res J 2012;9:57-62. Priyalakshmi S, Manish R. A review on marginal deterioration of composite restoration. IOSR-JDMS 2014;13:6-9. Swain M, Xue J. State of the art of micro-CT applications in dental research. Int J Oral Sci 2009;1:177-88. Chen X, Cuijpers V, Fan M, Frencken JE. Optimal use of silver nitrate and marginal leakage at the sealant-enamel interface using micro-CT. Am J Dent 2009;22:269-72. Neves AA, Jaecques S, Van Ende A, Cardoso MV, Coutinho E, Lührs AK et al. 3D-microleakage assessment of adhesive interfaces: Exploratory findings by μCT. Dent Mater 2014;30:799-807. Chen X, Cuijpers V, Fan M, Frencken JE. Marginal leakage of two newer glass-ionomer-based sealant materials assessed using micro-CT. J Dent 2010;38:731-5. Chen X, Cuijpers V, Fan M, Frencken JE. Validation of micro-CT against the section method regarding the assessment of marginal leakage of sealants. Aust Dent J 2012;57:196-9. Nemtoi A, Czink C, Haba D, Gahleitner A. Cone beam CT: A current overview of devices. Dentomaxillofac Radiol 2013;42:20120443.